What will forests be like? During the history of forestry there has been evidence for the disruption of the forest production cycle due to the appearance of insect pests, natural disasters and extreme climate changes- drought, strong winds, floods and frost. 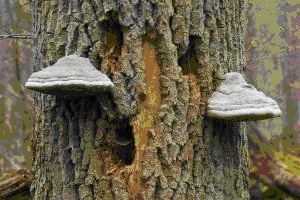 Fungal diseases are signs of modern times. Seedlings deprived of mycorrhizal fungi are vulnerable to parasitic pathogenic fungi. The number of harmful insects has increased partly because of humans who created even-aged monospecies stands in large areas. Because of the disturbed balance and the absence of self defense mechanisms of the forest ecosystem, the population of these harmful insects could rapidly increase, leading to disaster. The largest pest gradation in European forest history caused by the Nun Moth (Lymantria monacha) from 1978 till 1984 in Poland, destroyed about 1/3 of the country’s total forest area. These disasters can only be faced with chemicals which are expensive and have a negative impact on the environment. Since prevention is better than cure it is better to keep the balance of the forest ecosystem than try to face the negative impacts. 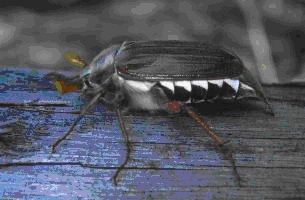 Climate change is increasing the risk of another insect gradation caused by a species with unknown economical impact. From 2005 to 2007 in central Europe a large number of oak died because of the larvae of jewelbeetle (Agrilus), which until then was considered a rare species. Among abiotic factors, wind has the most intense effects. Strong winds, braking and knocking down trees in large areas, hit European forests regularly with increasing frequency. 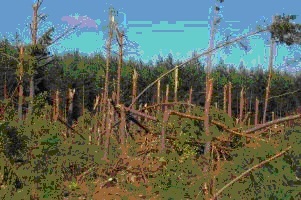 Particularly heavy losses are caused by wind in mountain areas, dominated by man-made spruce forests. Mixed forests are much more resistant to these threats, especially if they consist of species adapted to local conditions, such as beech and fir forests. Fire is another important factor. Forest fires have a devastating impact not only in the warm and dry southern countries but also in other European regions. That happens because of several factors: lower forest humidity (dehydration), rising average air temperatures, declining health of forest stands and greater human intervention. Unhealthy forests with open canopy let more light reach the understorey, thus helping ground vegetation, especially grass, to grow. Grass vegetation then becomes dry and can easily catch fire. Despite numerous threats the future of European forests is bright. Their total area is increasing. Forests continue to offer a lot to the people. Society continues to exert pressure on the State to abandon the productive functions of forest resources, or at least reduce them. There are many European programs for forest protection. European forests are certainly changing for the better.